There are 18 reviews of Secret Mélange. I like clove, bay rum spice fragrances but the orange, neroli aspect of Secret Melange is almost too much to bare. It does settle down and therefore it moves into neutral territory for me but that opening is cringe worthy, so actung baby! I will add this: I mix my own and have a few keepers I group as 'dirty orange'; I hold Kouros, Orange Spice, Tobac 1800, and even Paco Rabanne and Kiehls musk (because of the musk, I believe) in such high regard and share similar threads in the fabric... degrees of separation, if you will. They work, some spectacularly so; Secret Melange doesn't so much. 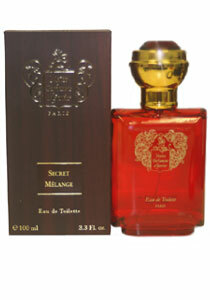 I love Secret Melange from beginning to end. The first spray is a soft clove with spices. Not a harsh clove like others I have tried. In the dry down the clove blends in with the citruses and flowers. I cannot stop smelling myself. It is different, that's for sure. That is what I like the most. Interesting and very old-fashioned. On me, Secret Melange starts off fairly dense and confusing. It's got an intricate skeleton, including a citrus-heavy chypre structure, as well as a mix of patchouli, sandalwood, and amber that smells like that very classic "oriental" mix. On this 1950's-style framework is a very soapy powdery clove smell, made quite fusty by all the classic ingredients. Not to disagree with the folks here who are complaining about Melange's linearity, but I can smell the familiar chypre structure working its way through the day, from citrus to galbanum to moss, though it all happens underneath the soapy powdery clove, which is very much the star of the scent. All in all, I like old clovey perfumes and I like Secret Melange. That being said, I think Diptyque's 1960's L'Eau does the same basic thing with less fustiness and more wearability, and I have a full bottle of Caron's Nuit De Noel, which does everything Melange does and more, and better. So I don't feel like I really need this, but I enjoy it. This comes on very strongly of orange and cloves and remains that way for 10+hrs.I get nothing but compliments on this and suggest that those comments comparing this to a bathroom are the result of spending too much time in bathrooms. This is one of the very few fragrances from MPG that I resolutely don't like. Spicy soapy orange, clove, spicy, cannelle spicy, soapy, orange, cannelle, cannelle, spicy orange orange cannelle spicy soapy orange, what? ?, cannelle...messy isn't it?. It definitely smells like bathrooms. Bizarre, in a bad way! It strikes me as one of the strangest fragrances from MPG that I’ve encountered so far. Strange in the sense that it doesn’t seem like something MPG would make. Unlike many of the other MPG’s, it lacks any kind of drama or panache or even identity. It’s just an odor: not pleasant and not disagreeable not subtle not aggressive … it’s just there with a smell that reminds several people, myself included, of bathrooms. It seems like something Demeter would make: a plain linear scent—no movement, no progression, and no nuance—a copy of an interesting random olfactory occurrence (Demeter picks more interesting random olfactory occurrences than the bathroom accord in Secret Mélange). This particular mélange is one with a predominance of cloves supported by some lavender and some lemony orange and something burned—probably the patchouli. That’s it; that’s all there is: On my skin it is just a ho-hum odor. Certainly not a bad fragrance, but, after an hour or two of smelling it, I’m basically thinking: “What’s the point?” Perhaps Secret Mélange should have remained a secret. There are no member images of Secret Mélange yet. Why not be the first?